Enter your full name on the first line. This will automatically fill in the user name field with the lowercase version of your first name. You can either leave it that way or change it to something else. Now enter your password twice so the installer can make sure you got it right. Try to use something safe that includes both lowercase and uppercase letters as well as numbers, and is at least 8 characters long. After the password comes the computer name, which, like the user name, can be whatever you want. For example, the name of my server is iceberg and the name of my desktop computer is shawn (my name and the same as my user name). At work we use cartoon and comic book names for all the machines, so there are names like zoidberg and stewie. Whatever works for you. The last section lets you specify how you want to log in and and possibly decrypt your home directory. I haven’t tried encrypting my home directory and I always want my machine to be protected from somebody just turning it on and automatically having access to it, so I always use the second choice, Require my password to log in. Once you’ve set all these fields, press the Forward button. 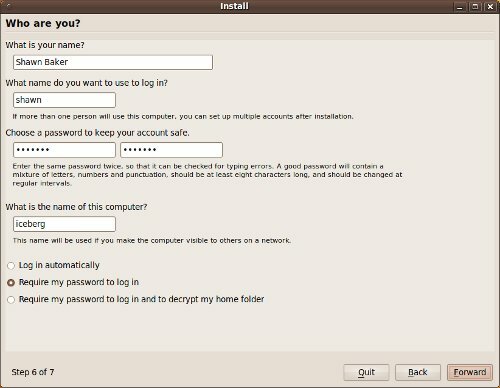 If you used a simple (weak) password, the installer will warn you with the following popup window. Either press Choose another password to go back and enter a better password (twice), or press the Continue button to go to the last install screen. 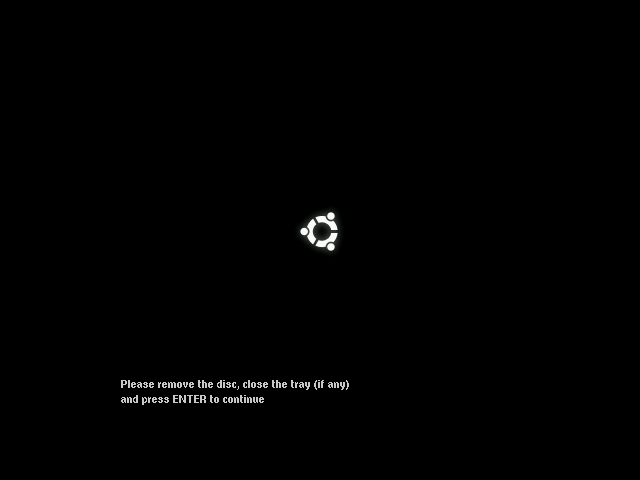 The last install screen is a simple confirmation screen. It will display the choices you made in the previous screens and allow you to Quit the install completely, go Back and change your choices, or proceed with the Install. 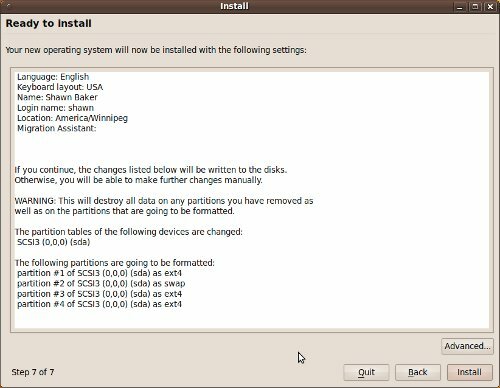 Pressing the Install button will make all of your partition changes permament and start copying the system files from the CD or flash drive onto the hard disk. So if you’re happy with your choices, press the Install button to start the process. 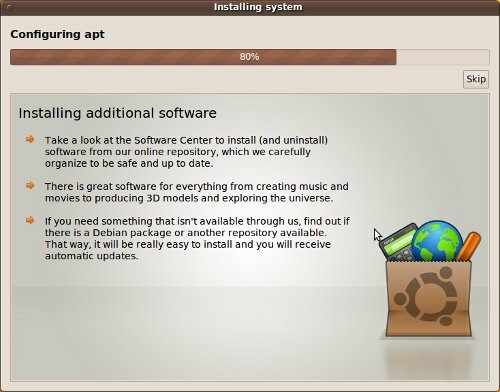 During the install, which will take between 5 and 20 minutes depending on the speed of your machine, you will see a series of screens displaying a progress bar and some general Ubuntu information. There’s nothing much to see here, just wait for the install to complete. Some of the screens may display a Skip button on the right hand side just below the progress bar. I have no idea what it does and I can’t image why you would want to skip some arbitrary part of the install. So just ignore it and wait for the install to complete. When all is said and done, the installer will display a completion popup window asking you to restart the computer. Press the Restart Now button. So remove your CD or flash driver and press the Enter key. 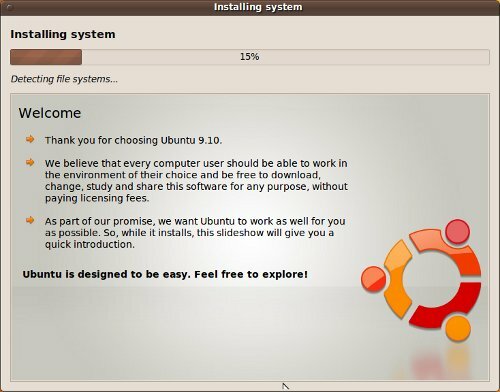 After a few seconds your computer will reboot, eventually taking you to the Ubuntu login screen.